Field family sports cupboard carved 1924, Launceston Church Grammar School . Who was Nellie Payne? Field family sports cupboard, Launceston Church Grammar School. 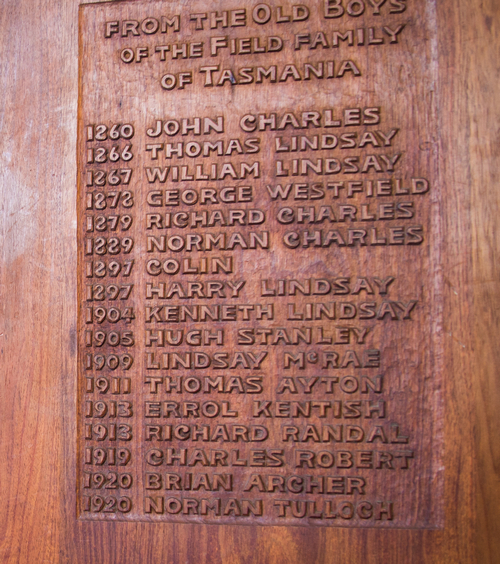 Detail of names on Field family sports cupboard, Launceston Church Grammar School. 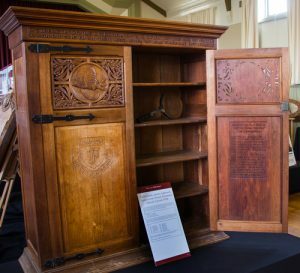 “In 1924 seventeen members of the Field family, all old boys of the school, resolved to present the school with a sports cupboard in memory of their school days. They asked their kinswoman, Mrs Nellie Payne (née Field) to design and carve it. The result was a very handsome piece of furniture which stands (in the 1970’s but not today) in the same room as the Max Field chair. When we long since are dust and wraith. The top of each of the two doors bears a richly carved panel, on the left a ringtail possum, and on the right a flying squirrel, each ringed in an intricate peppermint gum pattern. Below each panel is a carved medallion and motto; and inside the right-hand door are carved in high relief the names of all seventeen members of the Field family with the dates of their enrolment in the school, from 1860 to 1920.